Updated 2:10 p.m. | Posted 9:53 a.m.
U.S. Rep. Tim Walz, a Democratic survivor in Trump territory, dove Monday into a race for governor that will also put a Minnesota seat in Congress up for grabs. Walz, who lives in Mankato and has represented southern Minnesota for the past decade, is the first Democratic entrant from beyond the Twin Cities metropolitan area and the fourth from his party overall to announce a run. Two-term DFL Gov. Mark Dayton has said he will not seek re-election next year. 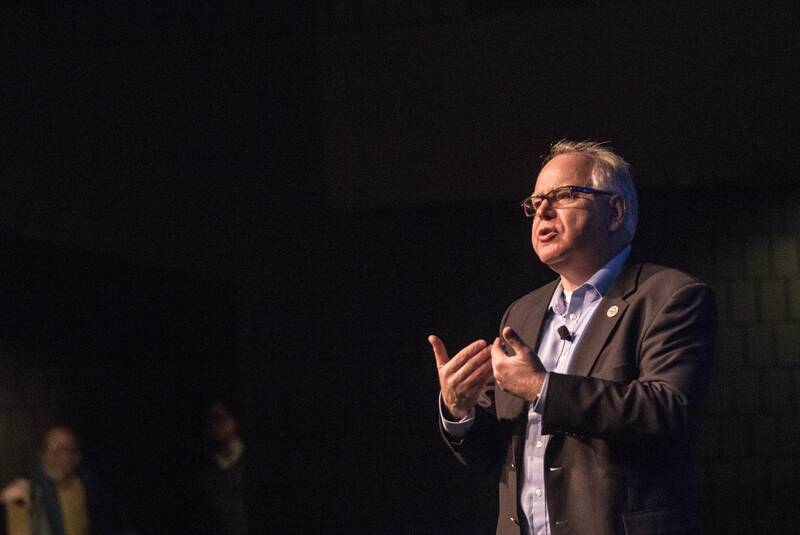 Walz launched his campaign with a "One Minnesota" theme, pledging to bridge geographical splits on issues facing the state, from transportation to guns. "I think I'm the one who can unify folks to see a bigger picture, to make sure it isn't this divide we've had and to bring a little different perspective to this race," he said. The former geography teacher and enlisted soldier came to St. Paul to open a campaign account, flanked by his wife and daughter. Wearing a red-and-black flannel jacket, blue jeans and scuffed shoes, Walz reminded reporters of his small-town Nebraska upbringing. "I always say I graduated with 24 kids in my high school class, 12 of whom were my cousins," he said. "That does create a unique perspective on things." He narrowly beat Republican challenger Jim Hagedorn last year to retain his Minnesota 1st Congressional District seat during a GOP landslide in much of Minnesota and the country. Walz, 52, said that he won despite Trump's convincing win in the congressional district. That, he said, speaks to his ability to attract swing voters. In an interview with MPR News, Walz said he was fully committed to the run for governor and wouldn't retreat to a congressional re-election bid if he falters. "There's no turning back," he said. "I want to work to make Minnesota the one Minnesota we know it can be. So I'm all in." As it now stands, he might not have a choice. The DFL Party might not hold its endorsing convention until after candidate filing closes in June 2018. 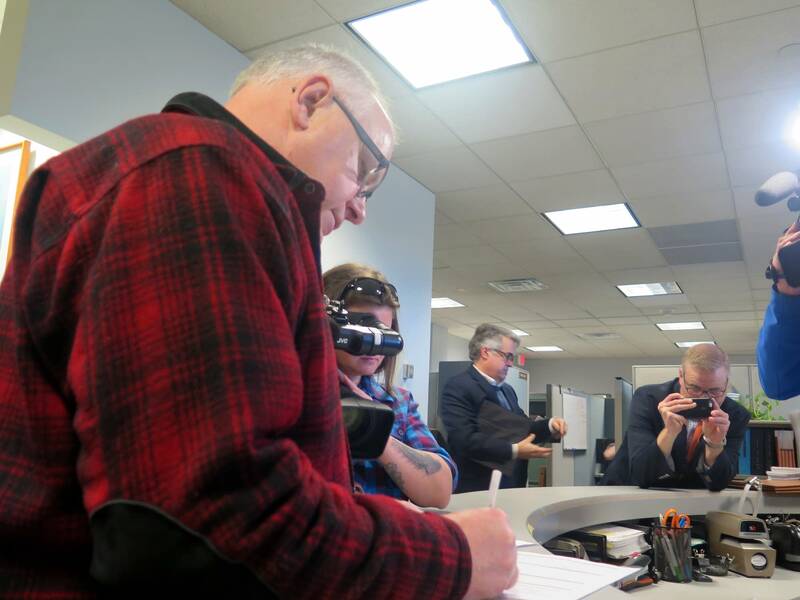 The run-up to a Walz gubernatorial campaign had been in the works for weeks or more. In February, Walz confirmed he was considering a run. Walz joins several Democrats who have already announced they're running: St. Paul Mayor Chris Coleman, State Auditor Rebecca Otto and state Rep. Erin Murphy, DFL-St. Paul. Other candidates are pondering the race, including fellow DFL Rep. Rick Nolan from the state's 8th Congressional District. While deemed a top contender in his party, Walz has some challenges ahead of him. Even as a member of Congress, Walz isn't widely known by Minnesota voters. He must prove he can raise the millions it will take to wage a statewide campaign. His schedule could be tricky. He's the ranking member on the House Veterans Affairs Committee, so he'll be busy in Washington while trying to build ground-level support in Minnesota. He'll no doubt be branded as a Washington politician, which can have a stinging effect with voters. That could explain why no one has made the direct DC-to-governor's mansion leap since Republican Al Quie in 1978. Only two other governors have gone straight from the nation's capital to the state capital: U.S. Sen. Elmer Benson in 1936 and U.S. Rep. Winfield Hammond in 1914. The Republican field for governor has yet to take shape, but several big-name politicians are sizing it up. A Walz bid for governor puts his congressional district in play. National Republicans have already indicated they would invest in flipping a seat the party once held. Hagedorn has already announced his intention to run again and other Republicans could get in, too. "Running in an open seat only increases my will to work exceptionally hard and personally engage southern Minnesotans in one-to-one conversations to earn their trust and votes," Hagedorn said in a statement.